​Top selection indicated in bold-face. Forecast: The Friday opener is an inscrutable maiden claiming turf miler for fillies and mares. We’re going four-deep but with no conviction, so the best advice is to include as many as you can afford. Etching is re-equipped with blinkers and ran well with the hood last year, so perhaps she can produce a forward move. At 6-1 on the morning line she may offer a bit more value than some of the others. Lil Respect, first off the claim for Sadler, gets a huge break in the weights and with just two career outings may have a bit more upside than some of the others. She should prominent throughout. Lucky Stepper had a prep down the hill and didn’t run all that badly vs. straight maiden company. She’s another with plenty of room to improve. Beyond Pleasure has numbers that fit and is back with Prat. Her recent form is ordinary but against this group she’s probably a contender by default. Forecast: There appears to be two main contenders in this five-runner restricting claiming sprint, with preference on top to Concur. 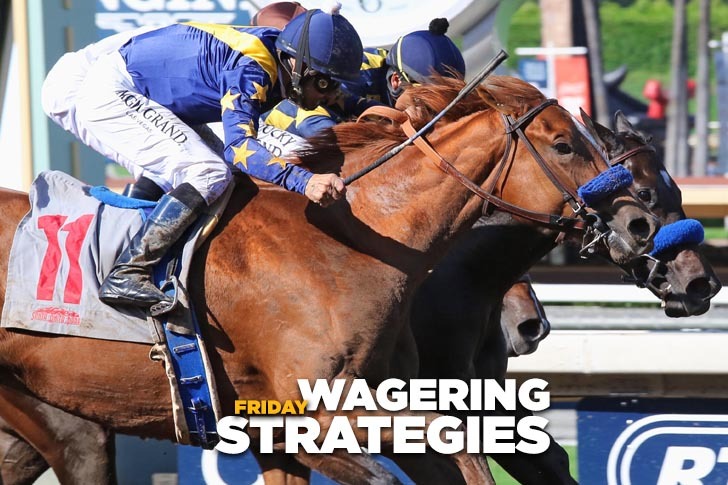 The D’Amato-trained gelding has the route-to-sprint angle that we like and is dropping to a realistic level after failing badly as the favorite up north. His race before last – a close fourth over this track and distance – earned a speed figure that is more than good enough to beat this field. Kidmon likes this track but missed at even money when a close second in a similar spot in his last start. He’ll be running on late. Forecast: ​Our Romance flashed good speed in her debut before weakening in the final furlong and winding up a distance second. The D’Amato-trained filly should be fitter today, though she’ll have to negotiate an extra half furlong. We’ll put her on top but also include Into Rissa, the most dangerous of the closing types but not trustworthy as a 15-race maiden. These are the two we’ll prefer but this is another affair that probably requires a considerable spread. Forecast: Palladium makes his first start since being for $32,000 in mid-February in a race that he was pulled up early but walked off. Clearly there’s a condition question but if the 3-year-old son of Greydar regains his best form – and the work tab at San Luis Rey Downs looks promising – he can get back on the beam with this class drop. Ack shortens in trip and drops in class, and the O’Neill-trained colt is a strong fit on numbers. If he can sprint, he can win. Forecast: Out of Balance is gradually improving with experience and seems ready to win after finishing a strong second in a similar spot in late January. She’s been working steadily since, retains Prat, and is the likely choice and one to beat. Decorating will be running on late and with only slight improvement figures in the thick of it. Both should be included in rolling exotic play with preference on top to Out of Balance. Forecast: Emmy and I adds blinkers, returns to dirt, shortens in distance and drops to a proper level. She’ll be on or near the lead throughout with anything close to her best effort. ​Duranga comes off a win in a $6,250 claimer over a sloppy track while earning a speed figure that makes her a threat right back despite the class hike. She can handle any type of track and has the proper style for this extended sprint distance. Forecast: Bump Bailey scored easily and impressivelyin his debut while earning a powerful speed figure, one that should make him odds-on to score right back in this first-level allowance sprint for 3-year-olds. The only concern is that the win was accomplished over a sloppy track and today he’ll have to show he’s every bit as good on dry land. We’ll make him a no-value rolling exotic single but otherwise pass the race. Forecast: Mo Bob changed tactics – he was taken back and allowed to produce one late run – and the result was a nice win vs. maiden claimers over this course and distance. This is a realistic spot – a $25,000 restricted (nw-2) affair – and the D’Amato-trained gelding looks capable of winning right back with good racing luck. East Rand has been a disappointment since being claimed for $50,000 last summer but drops to his lowest level ever and picks up Prat, making him the likely favorite and one to beat. We’ll use both in our rolling exotics and then have a few extra tickets keying Mo Bob on top.